Commissioned by the church council of the Roman Catholic Peter and Paul Church in Breda, The Netherlands, I painted this oil painting in 2006 for the newly built church. The subject is the Entombment of Christ. As the parishioners found the new church to be rather cold feeling, I was asked to make the building ‘more like a church’. It was a broadly formulated commission. In conversations with pastors, board members and representatives of the congregation we drew up an inventory of wishes. These mostly concerned the subject matter. A kaleidoscope of subjects resulted: from traditional Stations of the Cross to the portrayal of solidarity and God’s people on their journey. I made small sketches of a number of themes that were discussed in the next meeting. Two favourite topics surfaced: the Entombment of Christ, related to the remembrance of the deceased, and solidarity and community condensed in the theme of God’s people journeying on together. The Entombment is described in the New Testament by each of the four evangelists. It is, however, not included in the Stations of the Cross. The composition of my painting was inspired by a scene from a choreography by my wife, Margriet Franken. In 1990 I designed the lighting for this dance, years before 2006. The scene in the painting focuses on the time span just before the body of Christ is put into the grave. The depiction is completely plausible, even though it has not been documented in any of the texts. The portrayal is imaginative: in this way the progression from the cross to the grave could have taken place. Three men (disciples?) carry Jesus. Their height differs. The arms of the person in front are stretched out, while those of the man in the back are bent. The posture of their faces betrays emotion, while their steady rhythmical step reveals their resolute conception of their momentous task. Their clothing is elementary, their upper bodies naked. They are fishermen carrying the Ichthus. Like a trinity they hold him up in the air, at once close to the Father and close to the earth, where he just completed his mission. And he, the man from Nazareth, is he dead or alive? He seems to be looking at us; there appears to be a form of eye contact. The bearers look at the ground before them or into the distance. From the corner of their eyes they perceive the mark of the stigmata in the drooping right hand of Christ. Do his glance and posture already hint at Easter morning? His body refuses to submit itself to the seemingly inevitable earthliness of things. This will soon become clear. Along the feet of the bearers brushes a new and unsuspected light. It springs from the fiery glow on the right and dissolves in an ethereal coolness on the left. They carry him from right to left against a soft evening breeze to the place where peace reigns. Also the fishermen seem to have overcome death. 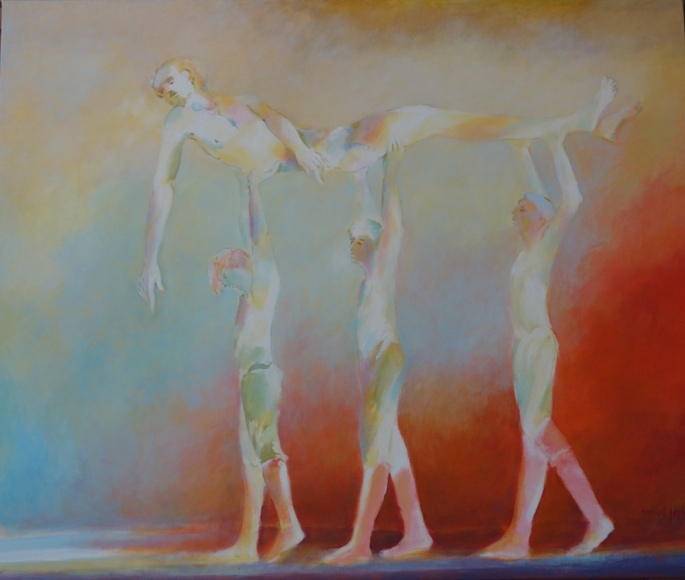 Michael Jepkes: Entombment, 2006, oil on canvas, 150 x 125 cm, Peter and Paul Church in Breda, NL. Michael Jepkes (b. 1938), graphic artist and painter, received his first drawing and painting lessons from Henk Koekkoek, Maarten Krabbé and Josef Verheijen in Amsterdam, The Netherlands. He then proceeded to study at the Art Academy of Tilburg. He developed a varied graphic oeuvre of prints and poetic visual stories. The visual arts, literature, music, dance and drama form sources of inspiration for him.